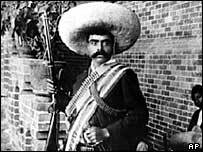 1910 - Beginning of Epic Revolution, triggered by unrest amongst peasants and urban workers, who are led by Emiliano Zapata. 1911 - Mexico's dictator, Porfirio Diaz, is overthrown. The new president is Francisco Madero, a liberal. Madero introduces land reform and labour legislation. Political unrest continues with Zapata leading a peasant revolt in the south. 1913 - Madero is assassinated. Victoriano Huerta seizes power. 1914 - Huerta resigns. He is viewed with suspicion by the United States for his alleged pro-German sympathies. Huerta is succeeded by Venustiano Carranza. 1916 - US forces cross the border in pursuit of the guerrilla leader Francisco "Pancho" Villa. 1917 - US forces withdraw, having failed to kill Villa. A new constitution is adopted, which is designed to ensure permanent democracy in Mexico. 1920 - Carranza is murdered. Civil war follows. 1929 - The National Revolutionary Party is formed. In 1946 it is re-named the Institutional Revolutionary Party, or PRI. 1934 - President Lazaro Cardenas begins programme of oil nationalisation, land reform and industrial expansion. 1940 - Leon Trotsky murdered in Mexico. 1942 - Mexico declares war on Japan and Germany. 1960s - Unrest amongst peasants and labourers over unequal wealth distribution is suppressed. 1968 - Student demonstration in Tlatelolco, Mexico City, during the Olympic Games is fired upon by Mexican security forces. Hundreds of protestors are killed or wounded. The extent of the violence shocks the country. 1976 - Huge offshore oil reserves discovered; the Cantarell field becomes the mainstay of Mexico's oil production. 1985 - Earthquake in Mexico City kills thousands and makes many more homeless. 1993 - Mexican parliament ratifies the North American Free Trade Agreement (Nafta) with the US and Canada. 1994 - A guerrilla rebellion in Chiapas by the Zapatista National Liberation Army is brutally suppressed by government troops. The rebels oppose Nafta and want greater recognition for Indian rights. The government recognises the Zapatista National Liberation Front (EZLN). 1994 August - Presidential elections won by PRI candidate Ernesto Zedillo Ponce de Leon, after the previous candidate, Luis Donaldo Colosio, was murdered. The stock market plunges in December, the peso loses a third of its value. 1995 - Former President Carlos Salinas goes into exile after his brother Raul Salinas is connected with Colosio's murder. 1995 November - The government and the EZLN reach an agreement on greater autonomy for the indigenous Mayans of Chiapas. 1996 - The insurgency in the south escalates as the leftist Popular Revolutionary Army (EPR) attacks government troops. 1997 - The PRI suffers heavy losses in elections and loses its overall majority in the lower house of parliament for the first time since 1929. 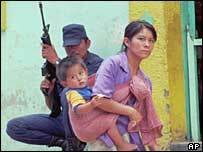 1997 December - 45 Indians killed by paramilitary gunmen in a Chiapas village. The incident causes an international outcry, President Zedillo starts an investigation. 1998 January - Governor of Chiapas resigns. Peace talks with the rebels are reactivated, but break down at the end of the year. 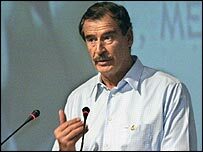 2000 July - Vicente Fox of the opposition Alliance for Change wins presidential elections, the first opposition candidate ever to do so. Parliamentary elections see the Alliance for Change emerge as the strongest party, beating the PRI by just over 1%. 2000 December - Vicente Fox is sworn in as president. 2001 March - Zapatista guerrillas, led by Subcomandante Marcos, stage their 'Zapatour', a march from Chiapas to Mexico City to highlight their demands. 2001 April - Parliament passes a bill increasing the rights of indigenous people. A few days later, Subcomandante Marcos rejects the bill, saying it leaves the Indian population worse off than before. Marcos says the uprising in Chiapas will continue. 2001 November - President Fox appoints a prosecutor to investigate the disappearance of left-wing activists during the 1970s and 1980s. 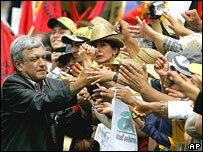 2002 March - Roberto Madrazo wins the contest to lead the PRI, which governed for 71 years until 2000. 2002 June - Millions of secret security files are released, shedding light on the torture and killing by security forces of hundreds of political activists in the 1960s and 1970s. President Fox says his government is not afraid to pursue prosecutions. 2002 July - Former President Luis Echeverria is questioned about massacres of student protesters in 1968, when he was interior minister, and in 1971 when he was president. 2002 September - Three army officers are charged with first-degree murder over the killings of 134 leftists in the 1970s. 2004 July - Investigator deems 1971 shooting of student protesters by government forces to have been genocide; judge refuses to order arrest of former President Luis Echeverria on charges that he ordered attack. 2005 January - Six prison officers are murdered and top-security jails are put on high alert amid escalating tension between the authorities and drug gangs. 2005 April - Political furore as Mexico City mayor and presidential favourite Andres Manuel Lopez Obrador is stripped of his immunity from prosecution by Congress in a land dispute. The government eventually abandons the prosecution. 2006 February - A federal post of special prosecutor is created to tackle violent crime against women. Mexico had been criticised by the UN and rights groups over the unsolved murders of more than 300 women over 12 years in the border city of Ciudad Juarez. 65 miners are killed in an explosion at a coal mine in Coahuila state. President Fox orders an investigation. 2006 July - Conservative candidate Felipe Calderon is declared the winner of presidential elections with a razor-thin majority over his leftist rival, Andres Manuel Lopez Obrador, who challenges the result with mass street protests. The Federal Electoral Tribunal confirms Mr Calderon's win in September. 2006 October - US President George W Bush signs legislation to build 1,125km (700 miles) of fencing along the US-Mexico border. 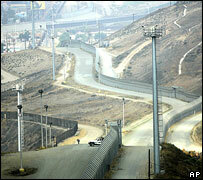 Mexico condemns plans for the barrier, which is intended to curb illegal immigration. 2006 December - A new federal police force is created to tackle drugs cartels; thousands of troops are deployed in the western state of Michoacan as part of a major anti-drug trafficking drive. 2007 February - New law obliging authorities to take tougher action against domestic violence comes into effect. 2007 July - A financial website says that Mexican telecoms tycoon Carlos Slim has overtaken Microsoft founder Bill Gates to become the world's richest person. Genocide trial against former president Luis Echeverria is suspended. 2007 October - Heavy rains flood nearly the entire southern state of Tabasco. Some 500,000 are made homeless in one of the country's worst natural disasters. 2008 Drug-related killings soar. Murders linked to organised crime leap to almost 1,400 in first five months of year. 2008 May - Attorney-general Eduardo Medina Mora says more than 4,000 people have been killed in 18 months since President Calderon took office and declared war on drugs cartels. About 450 of the dead are police, soldiers or prosecutors, and many of the killings have been concentrated along the US border. 2008 August - Hundreds of thousands join marches throughout Mexico to protest against continuing wave of drugs-related violence. 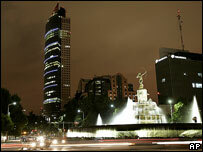 2008 October - Faced with drop in Mexican oil production, government passes series of energy reforms. Package includes controversial plans to allow private investment in state oil giant Pemex. 2009 January - Government unveils package of emergency measures worth nearly $150m (£100m) to protect economy from effects of US economic downturn. 2009 February - Reports say about 1,000 people died in a further upsurge in drug-related violence in the first six weeks of 2009. 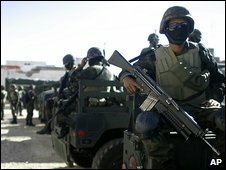 2009 March - Army troops enter Ciudad Juarez, on the border with the US, as open warfare erupts between rival drug gangs. 2009 April - Authorities close schools and public buildings after dozens are confirmed to have been killed by the virulent new swine flu virus. 2009 July - Opposition Institutional Revolutionary Party (PRI) makes large gains in mid-term congressional elections, winning 48% of seats in the Chamber of Deputies. 2009 October - Murder rate in Ciudad Juarez on Mexico-US border reaches all-time high amid battles between rival drug cartels. 2009 December - One of Mexico's most-wanted drug lords, Arturo Beltran Leyva, is killed in a shoot-out with state security forces. The authorities put the number of drug-related killings for 2009 at around 6,500, the worst year of bloodshed since President Felipe Calderon declared war on the drug cartels in late 2006. 2010 March - President Calderon calls on United States to share responsibility in battle against drug trafficking, after murder of three people connected to US consulate in border city of Ciudad Juarez. 2010 August - US President Barack Obama signs into law a $600m bill to put more agents and equipment along the Mexican border to stem the flow of illegal immigrants. 2010 December - Wikileaks releases US diplomatic cables revealing that the US ambassador questioned the Mexican security forces' ability to tackle organised crime. 2011 April - Thousands participate in protests across Mexico against drug-related violence. The marches are called by Mexican poet Javier Sicilia, whose son was murdered in March 2011; protests continue throughout the summer. 2011 June-July - Two crime journalists, Miguel Angel Lopez Velasco and Yolanda Ordaz de la Cruz, are killed in separate incidents. 2011 August - An attack on the Casino Royale in Monterrey kills 52 people, after gunmen douse the building with fuel and set it alight. President Calderon describes the attack as "an abhorrent act of terror." 2012 May - The army arrests a drug cartel leader over the killing of 49 people whose mutilated bodies are dumped on a major road in Nuevo Leon state. The massacre is one of the worst atrocities committed in the ongoing drug war. 2012 July - The Institutional Revolutionary Party (PRI) candidate Enrique Pena Nieto wins the presidential election, defeating veteran leftwing candidate Andres Manuel Lopez Obrador and ending 12 years of rightwing National Action Party (PAN) rule. PAN candidate Josefina Vazquez Mota came a distant third. Thousands take to the streets to allege vote-buying by the PRI, and Mr Lopez Obrador launches a legal challenge to the result. 2012 September - Andres Manuel Lopez Obrador rejects court ruling upholding July's election and called for a mass demonstration in protest.